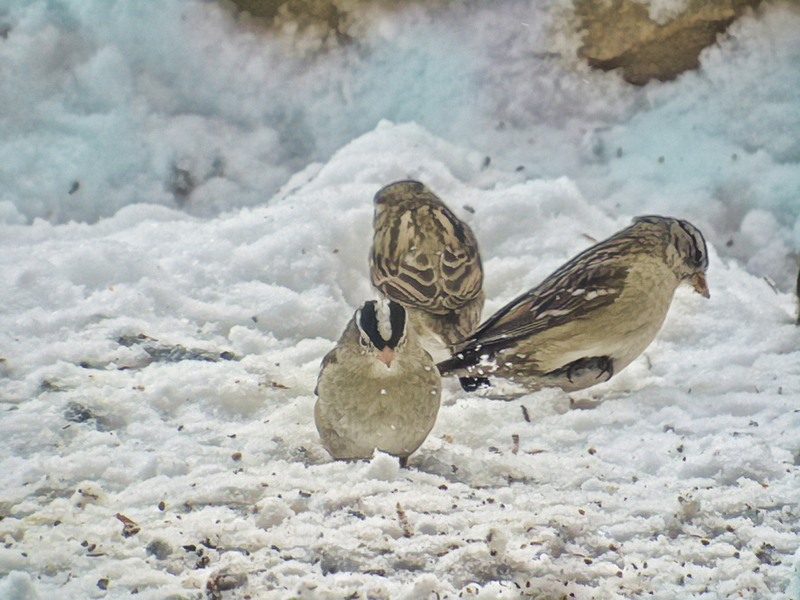 These sparrows are scratching in the snow to dig up seeds that fall to ground from their feeder. I don't know why they seem to prefer these to the ones they can easily obtain from the feeder, but they seem to enjoy these. It seems like hard work to me. They are SO intent on finding just what they want/need. Concentration embodied. What an interesting grouping of handsome sparrows. I like how the snow is in planes determined in color and recession. The blue and pink area is very beautiful, and as like a dawn or late afternoon sky as snow. Fine image. Reminds me of our back porch. They look through our window and chirp when the seed is gone. I love to watch the birds come out to eat. Thank you for sharing this. They could be scratching for grubs beneath the snow as a compliment to the seeds. Very nice capture, wonderful detail. Proudly hosted by Sargasso Networks. Current Server Time: 04/21/2019 01:07:40 PM EDT.